Welcome to Spaceflight Now's live coverage of the inaugural Falcon 9 rocket launching a Dragon test unit on a demonstration flight. Text updates will appear automatically; there is no need to reload the page. Follow us on Twitter. The Falcon 9 rocket has been lowered back to the horizontal position at Complex 40 following yesterday's wet dress rehearsal. Elon Musk, SpaceX's founder and CEO, says a few patches of cork covering the exterior of the first stage became debonded during the practice countdown, but the issue is not considered serious. Super-cold liquid oxygen causes the rocket's structure to contract during fueling, apparently triggering the cork to debond. "The whole first stage is covered in special high temperature space grade cork, not for insulation but to allow for the possibility of recovery via parachute," Musk told Spaceflight Now. "Some of the cork on the LOX tank did debond during LOX load, as we didn't allow enough contraction joints." The cork wasn't put on the rocket until it reached Florida, so the issue was not discovered during stage ground tests at SpaceX's facility near Waco, Texas. "We will adjust accordingly and reapply the cork in the next week or two," Musk said. Taking advantage of a picturesque day in the Sunshine State, the privately-developed Falcon 9 rocket came to life Friday afternoon as engineers loaded 75,000 gallons of propellant aboard the vehicle during a simulated countdown. Friday's countdown wet dress rehearsal was "the smoothest test we have conducted to date," said Tim Buzza, the Falcon 9 launch director. The booster has spent the last week at Complex 40 after being assembled inside a hangar at the pad's southern perimeter. Stormy weather and high winds earlier this week pushed the countdown rehearsal to Friday. Today's wet dress rehearsal was successful, according to a SpaceX spokesperson. The launch team flowed liquid oxygen and kerosene into the Falcon 9 rocket on Friday afternoon, the first time propellants have been loaded into the 15-story rocket at Complex 40. The test included a simulated countdown and exercised many of the rocket's systems for launch. SpaceX says the next milestone will be a 3.5-second ignition of the Falcon's nine first stage Merlin 1C engines. The engine test will occur some time next month. 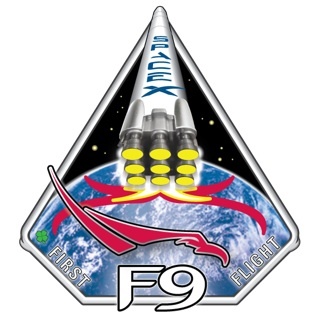 The Falcon 9 wet dress rehearsal should be wrapping up after nightfall at Cape Canaveral, but SpaceX has not provided any updates on the test's initial results so far. The Falcon 9 practice countdown continues as the sun sets at Cape Canaveral. Engineers are continuing to put the Falcon 9 rocket through its paces at Cape Canaveral. The booster's first stage is covered in ice from the super-cold liquid oxygen inside. Liquid oxygen at Complex 40 is stored in a 125,000-gallon sphere on the southeast side of the launch pad. Refined rocket-grade kerosene is stored in cylinder-shaped tanks on the west side of the pad. "When we start liquid oxygen loading an hour-and-a-half out, we load both stages and we eventually end up with concurrent propellant loading. We'll start both stages at the same time, and we'll get liquid oxygen loaded in," Buzza said. The cold liquid oxygen is used to condition helium pressurant spheres inside the rocket to about -300 degrees Fahrenheit. "We'll probably get to roughly 50 percent load on liquid oxygen, and at that point, our helium spheres are now submerged in liquid oxygen, so we can begin the fast fill of helium. We load helium cryogenically from the ground. We pass it through a nitrogen bath, so that when we go in with fuel, we have less heating and you can really load fuel quite quickly." "We want to take them one at a time," Buzza said. "We usually stagger them roughly 10 or 20 minutes apart. LOX starts in both stages, helium starts in both stages, then fuel." The Falcon 9 second stage is now being loaded with liquid oxygen. Liquid oxygen vapors are again venting from the Falcon 9 rocket. This is the first time the rocket has been fueled at Complex 40. During the wet dress rehearsal, engineers plan to load nearly 39,000 gallons of super cold liquid oxygen and almost 25,000 gallons of kerosene fuel into the first stage tanks. About 7,300 gallons of liquid oxygen and 4,600 gallons of kerosene will go into the second stage. SpaceX will not discuss the exact sequence of this afternoon's test. Kerosene and LOX propellants flow into the first stage through the pad's launch mount at the base of the rocket. 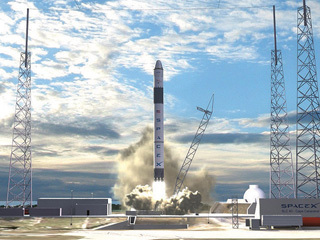 The same propellants enter the second stage through an interface near the top of the transporter/erector, which also acts as the umbilical tower. Liquid oxygen is loaded first, followed by helium and kerosene fuel. Today's practice countdown is also an exercise for the Falcon 9 launch team, which includes about 29 managers and engineers inside the SpaceX Launch Control Center near the south gate of Cape Canaveral Air Force Station. Liquid oxygen vapors began venting from the Falcon 9 rocket a few minutes ago, indicating fueling of the booster was underway. But the venting has now stopped. At Complex 40, the transporter/erector has retracted to a point about 15 degrees away from the Falcon 9 rocket. The movement is a potential sign the wet dress rehearsal is about to begin. During a normal countdown, the structure moves away from the 154-foot-tall launcher about 90 minutes before liftoff. "Right before we start propellant loading, we'll rock this strongback back, so that the hoses get stretched out," said Tim Buzza, Falcon 9 launch director. "It will look like an umbilical tower that you might see at any other site. This acts as the fixed umbilical tower, the launch base, it's everything." The strongback stays tilted 15 degrees from the rocket through launch. During the wet dress rehearsal, SpaceX will load kerosene and liquid oxygen propellants into both Falcon 9 stages. The Falcon 9 rocket is again vertical at Complex 40 after waiting out thunderstorms and brisk weather the past two days. Testing is expected to resume tomorrow. SpaceX has temporarily halted testing of the Falcon 9 rocket at Complex 40 because of approaching stormy weather. The forecast calls for thunderstorms this afternoon around Central Florida, so SpaceX rotated the 154-foot-tall rocket back horizontal for safety. The privately-developed Falcon 9 has been on the launch pad since Saturday for ground tests. A countdown dress rehearsal and 3.5-second engine test will be accomplished soon. Before a new launch vehicle is cleared for liftoff from Cape Canaveral, federal regulators and Air Force officials meticulously go over the rocket's safety systems to verify the mission will pose no danger to the public. The process is in motion again as SpaceX prepares to launch its first Falcon 9 rocket, a thoroughly-tested but unproven launcher that could blast off as early as next month. The Air Force 45th Space Wing and the Federal Aviation Administration are still reviewing paperwork on the new rocket, which is currently on the launch pad at Cape Canaveral for several days of ground tests. SpaceX has released a few pictures from Saturday's milestone rollout of the Falcon 9 rocket at Cape Canaveral. See the photo gallery. SpaceX hoisted the first Falcon 9 rocket atop its Cape Canaveral launch pad on Saturday, beginning several days of compatibility checks to be punctuated by a dramatic ground-shaking engine test next week. Pulled by an aircraft tug normally found on airport tarmacs, the rocket and its transporter rolled 600 feet along rail tracks from the steel assembly hangar to the launch pad at Complex 40 on Friday. After emerging from the hangar Friday, the 15-story rocket was rotated vertical around midday Saturday. All the pieces of the first Falcon 9 rocket due to launch between March and May have been trucked into Cape Canaveral, leaving just a handful of final tasks and closeouts before the booster is lifted atop the pad for tanking and engine tests. The rocket's second stage arrived at the Cape earlier this week after finishing acceptance testing in Texas, filling the shiny new SpaceX hangar at Complex 40 with rocket hardware for the first time. SpaceX has completed testing of the Falcon 9 rocket's propulsion system as launch preparations get underway at the company's Cape Canaveral launch site for the vehicle's first flight. The Falcon 9 rocket's second stage was fired for five-and-a-half minutes Saturday at SpaceX's test facility in McGregor, Texas. "The SpaceX team kicked off 2010 with the successful full duration orbit insertion firing of the Falcon 9 second stage at our Texas test site," SpaceX founder Elon Musk wrote in a posting on the company's Web site. The Falcon 9 rocket will launch on a test flight.